Dragongate: The Amazon Adventure #1. The Peter Duck Expedition. The Amazon Adventure #1. The Peter Duck Expedition. Behind us on the receding horizon in Palm Beach, Florida, some pre-Christmas fireworks are sparkling in bright colours. Ahead, behind the mast and sail, the moon drifts through light veils of cloud. Somewhere, 50 miles ahead of us, hidden in the darkness, is our destination; the Bahama Islands. My 11 year old daughter Gwyneth and I are sailing our 26`open-deck catamaran across the Gulf Stream on our first night passage; in fact this is our first venture out into the open ocean since launching our new boat over on the west coast of Florida near Tampa. The rope lashings that tie the cross members of the hulls together squeal and complain. 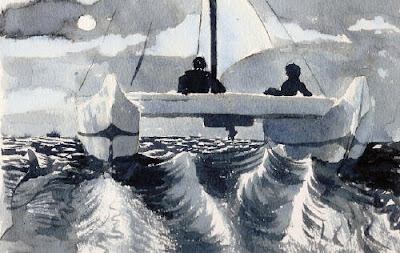 The waves splash aside with our passage, a dolphin or two rise grey in the moonlight to say hello, and distant shipping sail up and down the strait. Gwyn, is trying hard to play her part as crew just as the children in the ‘Peter Duck’ book do, but she is dropping off to sleep. We practice doing times tables and capital cities of Canadian provinces to keep her awake. My wife Heather, and daughters Anne (15 ) and Elaine (13 ) are trying to sleep below in the hulls until it is their turn on watch to steer the compass course. It was only six months ago that we launched this sailing idea back on our Gulf Island near Victoria, BC on the West Coast of Canada. Obviously, a lot has happened since then! A situation had opened up some possibilities in our ‘back to the land’ life on Saltspring Island. Our children were entering their teenage years with no experience of the world beyond our island shores and I had just missed getting the art teaching job at the local high school. My work as a Park Ranger was seasonal and I had completed all the house building I usually filled my winter months with. How could we make my seasonal employment into a plus in our family`s life? Heather and I had begun to get the itch to do something revolutionary. ( Perhaps it was that wild look in my eyes that cost me the job!) The family, deep into reading the Arthur Ransome series ‘Swallows and Amazons’ had just finished ‘ Peter Duck’, a story full of children and pirates, set in the coral islands of the Carribean. When we suggested a winter holiday,‘Lets go to the South Seas,’ was the enthusiastic vote. Thus the ‘Peter Duck Expedition’ was born. It is amazing how the first great hurdle is finding the strength to make a change, but once made, how things immediately begin to flow from there. Looking at a map we decided that buying a big boat and sailing to Hawaii in the Pacific was too ambitious for us, especially given that we wished to leave within six months. We found that the Bahama Islands off the coast of Florida, on the other side of the continent, had shallow protected waters, islands, coral reefs and palm trees. They even had a long reputation for piracy! We could drive there - or at least to Florida, just across a little blue strip of water from the Bahamas. We could do all this during my winter lay-off from the Parks. We parents were both trained teachers, so we could teach our own children so they would not loose a year of school, and travelling in lands less wealthy than our own was an education we wished our children to gain before they were completely absorbed by our unquestioning consumer society. We looked into buying a small sailboat in Florida for our adventure and then reselling it before we returned home. The thought of all five of us in something like a Cal.20. felt claustrophobic and besides, the time taken to locate one and then re-sell it would gobble up precious adventuring time. We would build a trailerable, specially designed boat and take it with us. I started sketching possible solutions and quickly focused down to the idea of an open decked plywood catamaran that could be transported disassembled and expanded on launching day in Florida ( just add water.). A week later, I found a description of a James Wharram 26` catamaran that was very much like my own design idea. We sent for the plans! I was well into my summer Park Ranger work by the time the correct plans arrived. Having no time to build, I priced out what it would have cost me to build it and then went shopping for what it would cost to have it built for us. After all, I reasoned, the building plans were of a rapid stitch and glue style that would be quick to build. Maybe the limited labour costs would be offset by the cheaper cost of materials available to a professional builder? We found our builder ( Hugh Campbell.) for the right price in the town of Sidney, just a quick ferry ride away from home. With the boat building under way, we sold our VW van and bought a Ford station wagon to tow our boat. Heather and our friend Ken Dobson designed and built two galley boxes (kitchen) that could fit on deck. We bought a large Sears tent, and with zippers, Heather remade it into a deck tent to give us an enormous airy home while at anchor. A propane cylinder, light and stove, a porta potty, a used 4- stroke Honda outboard, a VHF radio and many more bits of inexpensive camping kit were ready by the time AMAZON finally came home from the builder on the flat deck trailer we had bought and rebuilt especially for it. Anne, Elaine and Gwyneth had already started school in the Fall by the time the boat arrived and I was laid off for the winter, so we visited their teachers and got the course outlines that the children must follow. Their science teacher asked that they study how people on the islands we were to visit dealt with infrastructure like transportation and fresh water. We brought along all the novels the girls had to read while they were away. I built shelves into Amazon`s hulls to contain them all! One morning we drove onto the ferry to the mainland with our long rig trailing behind, doffed our disguises as mild mannered Islanders and carefully adjusted our bandannas and eye patches. ARRRR, we were off! Good on you all! Can't believe no one has any comments! Everyone is asleep at the wheel?